← PERODUA PUN POTONG HARGA! KL MAYOR FORCES OLYMPIC DAY FUN RUN TO CHANGE ITS VENUE TO PADANG MERBOK! IS THE OLYMPIC COUNCIL OF MALAYSIA (OCM) JUST A POLITICAL STOOGE? FORCED TO CHOOSE PADANG MERBOK BY THE KL MAYOR, THE OCM AGREED. THAT WAS YESTERDAY. TODAY, THE OCM, AFTER SPEAKING TO MCDONALD’S, ANNOUNCES: THE FUN RUN IS POSTPONED BECAUSE OF THE HAZE. WHAT IS THE KL MAYOR’S NEXT MOVE? Organisers for the Olympic Day Run slated for June 23 at Padang Merbok has postponed the event, citing health concerns due to the worsening haze. 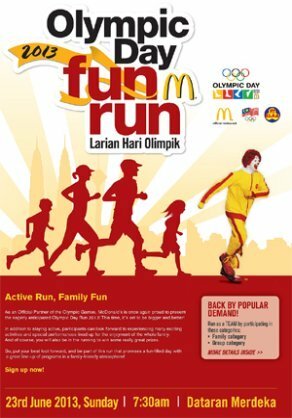 “After due consultation with the Olympic Council of Malaysia (OCM), both McDonald’s Malaysia and OCM have agreed to postpone the Olympic Day Run scheduled for June 23, 2013, since prolonged outdoor activities could be detrimental to health,” McDonalds Malaysia posted on its Facebook page at about noon today. The same posting has also been posted on OCM’s official Facebook page. Previously, the Kuala Lumpur City Hall (DBKL) had cited OCM’s booking of the field as one of three reasons for not allowing Pakatan Rakyat to use it for its ‘Black 505’ rally, scheduled for June 22. 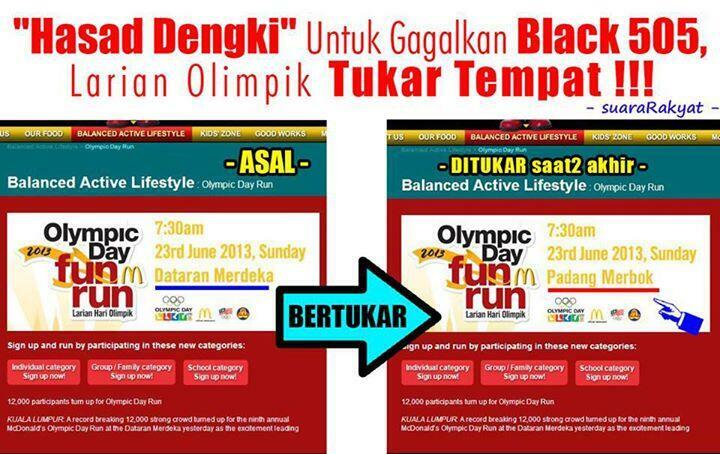 It has changed the venue for the Olympic Day Run scheduled on 23 June 2013, Sunday at 7.30 a.m. in Dataran Merdeka, to Padang Merbok! OCM say that the change was initiated by DBKL! The plot thickens! When KL Mayor Ahmad Phesal Talib realised that there were two approvals as opposed to his insistence that the approval for the OCM run was only for Padang Merbok, Sieh said that the DBKL head asked him to pick only one venue but recommended Padang Merbok. “As he had openly said we are having it in Padang Merbok, he said (we should have it there) also for other reasons one being security, better use Padang Merbok,” revealed the OCM honorary secretary. The Olympic Council Malaysia (OCM) explained that KL City Hall (DBKL) yesterday asked it to change the venue for its Olympic Day Run this Sunday because of “security reasons”. It was also because the local government had openly stated the venue was Padang Merbok despite the sporting body promoting it as Dataran Merdeka. “They were all the time talking Padang Merbok, they forgot we already had approval for Dataran Merdeka,” OCM honorary secretary SIeh Kok Chi told KiniTV today. Sieh however clarified that he assumed that City Hall forgot that the sporting body had obtained two approvals, one to use Padang Merbok and another to use Dataran Merdeka as the venue for the same event, as maybe change of personnel or that the approvals were made long ago, caused the mix-up. He explained that the approval for Padang Merbok was obtained by OCM from DBKL in January 2012, but later as the expected number of participants increased, they changed the venue to Dataran Merdeka, applying and obtaining another approval in April 2012. Sieh added they however never cancelled their Padang Merbok approval. Change of Venue for the Olympic Day Run 2013Please take note that the venue for the Olympic Day Run scheduled on 23 June 2013, Sunday at 7.30 a.m in Dataran Merdeka , has been changed due to unforeseen circumstances.The new venue for the Olympic Day Run 2013 is now at Padang Merbok, Jalan Parlimen, Kuala Lumpur.We regret for all inconveniences caused. Rafizi expressed pity for OCM as he believe they are being dragged into the matter because of “political interference”, and must have been ordered to change the venue at the last minute. Olympic Day Run venue change a ‘conspiracy’? A last-minute switch from Dataran Merdeka to Padang Merbok as the venue for Sunday’s Olympic Day Run by the Olympic Council of Malaysia (OCM) has raised the eyebrows of quite some people. At least one netizen has cried out that this is “a conspiracy”, on grounds that the venue switch is to give the Kuala Lumpur City Hall (DBKL) strong reason to reject PKR’s application to use the Padang Merbok a day earlier for Pakatan Rakyat’s KL ‘Black 505′ rally. Shortly after noon today, OCM announced on its Facebook site that it was changing the venue for the run that it had booked last year. “Please take note that the venue for the Olympic Day Run scheduled on 23 June 2013, Sunday at 7.30 a.m. in Dataran Merdeka, has been changed due to unforeseen circumstances. “The new venue for the Olympic Day Run 2013 is now at Padang Merbok, Jalan Parlimen, Kuala Lumpur. We regret for all inconveniences caused,” states the OCM Facebook posting. Checks by Malaysiakini with the council’s website, as well as that of the event sponsor McDonald’s, clearly list the venue as Dataran Merdeka. Attempts by Malaysiakini to contact the OCM office today for an explanation on the sudden change of venue have been futile because “no office-bearer is available” to answer our queries. One Facebook user commented on the venue change: “… cos they wanna let DBKL has valid reason to reject the black rally on this sat. they can say the gathering will spoil the preparation of McD run”‘. This entry was posted in Uncategorized and tagged Black505 KL, last-minute switch from Dataran Merdeka to Padang Merbok, McDonald's, OCM, olympic day fun run, Pakatan Rakyat. Bookmark the permalink. 1 Response to KL MAYOR FORCES OLYMPIC DAY FUN RUN TO CHANGE ITS VENUE TO PADANG MERBOK!